Even though the DVD is twenty years old, and has been largely surpassed by newer technology (BluRay, and then online video) it is still a very common format. There are many players on the market and in homes that can play a DVD. Just like an Audio CD is a special format (not simply audio files copied onto a CD), a DVD is also a special format. There are a few players that will play movies that have simply been copied onto a DVD, but there are many that require it to be in the special "DVD-Video" format. This format consists of a special DVD-Video container that wraps video encoded with the MPEG2 codec. One or more video files may be stored on the DVD, each in its own .VOB file. 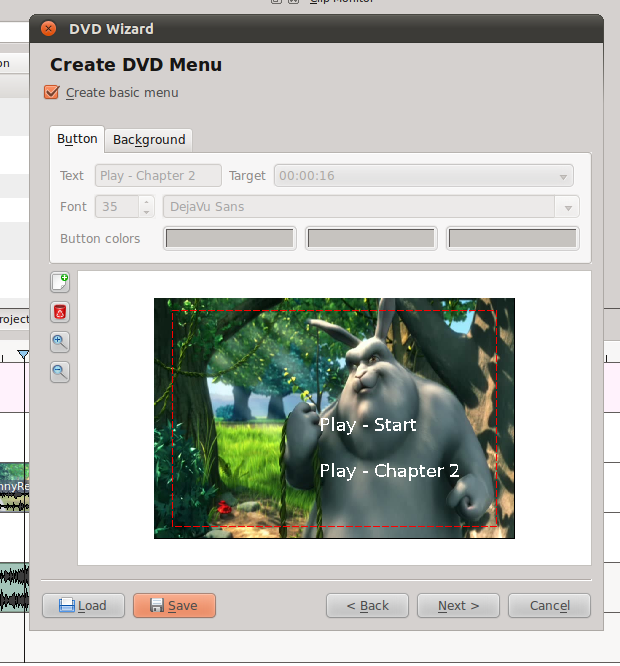 The DVD-Video format also allows for things such as menus, titles, chapters, optional subtitles, optional audio tracks, and alternate video tracks. The .IFO (and the backup of the .IFO called the .BUP) is used to store the data (time codes, options, etc.) for all these different features. Below is the layout of a standard DVD-Video container. 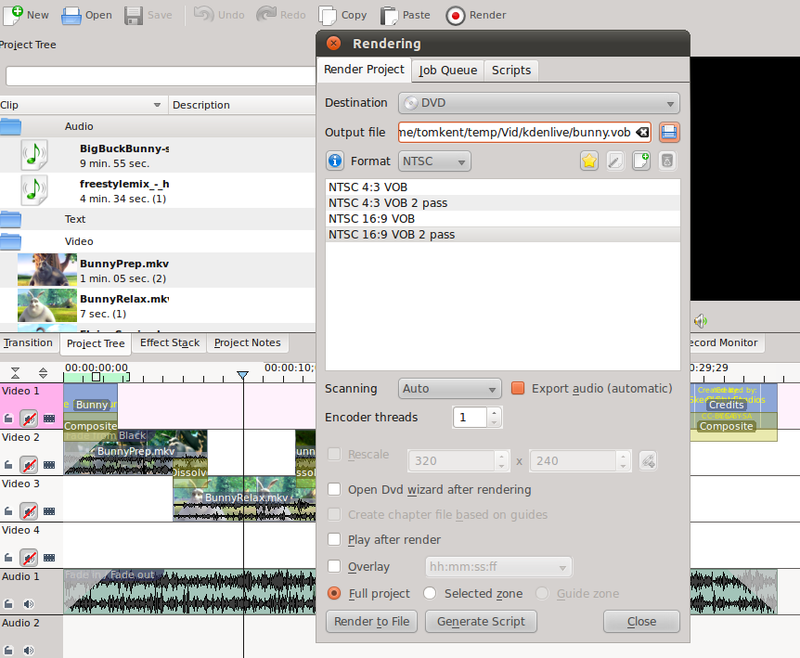 The .VOB file that is circled in red is the first .VOB file that will usually contain the video. The .VOB file immediately above it (VTS_01_0.VOB will usually contain a menu). 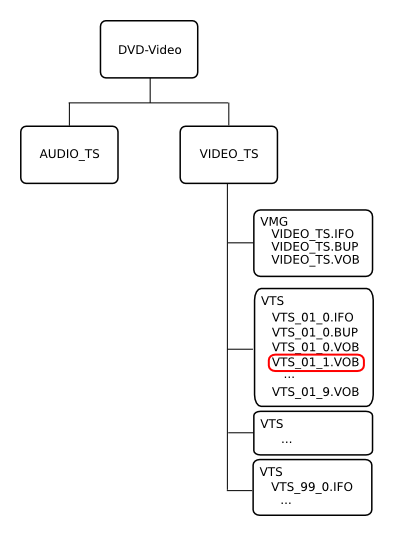 The VMG stands for Video ManaGer and the VTS stands for Video Title Set. All these files are within the VIDEO_TS directory on the disk. The AUDIO_TS directory isn't used with the DVD-Video format, it is only for high definition audio discs. Most commercial DVDs come with a form of encryption built in to them. This system usually goes by the name CSS (Content Scrambling System) and prevents you from being able to copy video on the DVD to your computer without a special decoder. These decoders are widely available, but are illegal to operate in some countries. However, when you create your own DVDs there is no reason to apply CSS to them. Since there are many decoders available, it won't stop people from copying your video, but for the videos you create with this course, you probably don't want to stop them anyway. 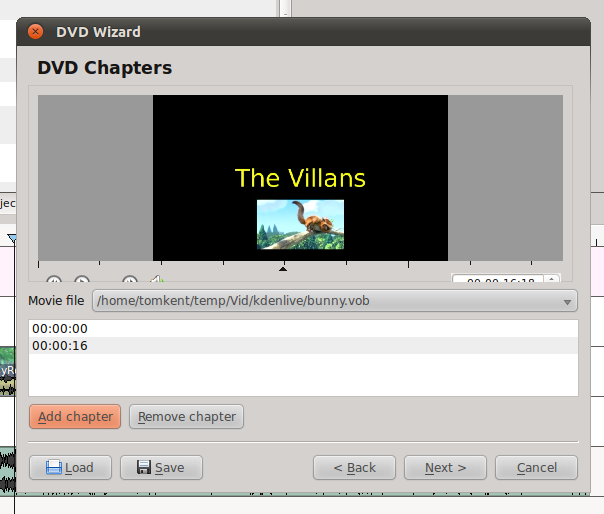 Making the VOB file to put on your DVD is easy in Kdenlive. Lets start by opening the project we created with the bunny in it. Then, go to render the video. Here, instead of choosing a file render, choose DVD from the drop down menu. You'll need to chose one of the 16:9 rendering options for this video (I'd recommend 2-pass). Give your vob a name (don't worry about the VTS stuff now) and render it. Once you're file has finished rendering, we're going to start Kdenlive's DVD Wizard from the File -> DVD Wizard menu. Here we need to select the same options we just rendered our VOB as (NTSC 16:9) and then click the Add Movie button to find our VOB and add it. Now we can go to the next page in the wizard and add chapters to our movie. Since ours is short, we'll just add one chapter. Use the navigation tools to go to the spot in the video where "the villans" first shows up, and click the add chapter button. Now we can hit the next button to move on. When you're happy with the menu, hit the next button. Now you're all set to make your DVD image. This will create a .iso file, which you can use DVD burning software to write to a DVD disc. Just name your ISO and hit the Create ISO image button. That's it, just take that ISO image and burn it to a DVD, then try it out in any DVD player. The DVD creation tools in Kdenlive are rather limited. For most simple projects, its great, however it is difficult to make more than one menu and do fancy things like multiple audio tracks, or optional subtitles. QDVDAuthor - Lots of features and quite powerful. DVD Styler - Really good for working with menus.